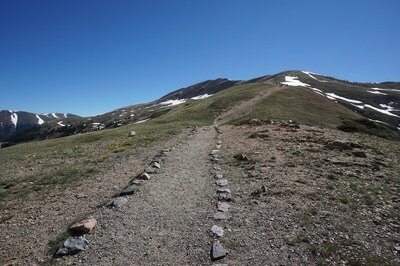 DIRECTIONS: The trailhead is at the top of Loveland Pass. From I-70 east of the Eisenhower Tunnel, exit at Loveland Pass (Hwy 6) and follow it to the top of the pass at 11,990 ft. There is parking at the pass and additional lots a bit further down the west side of the pass. 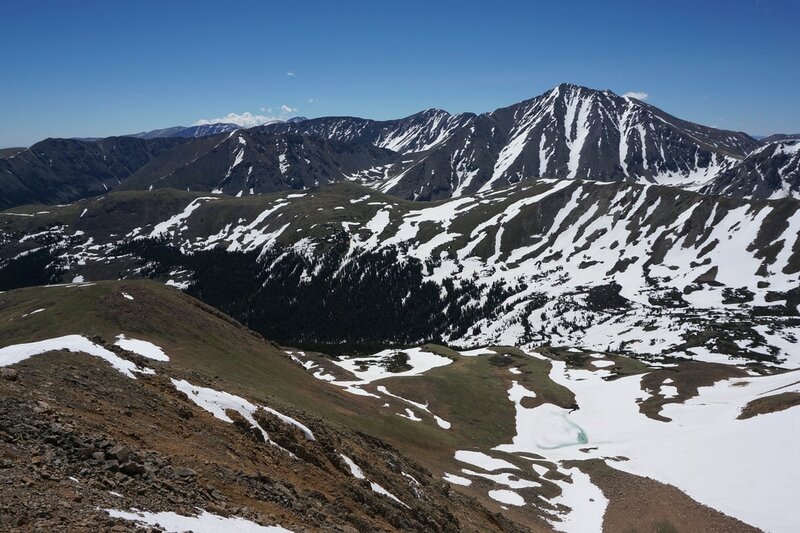 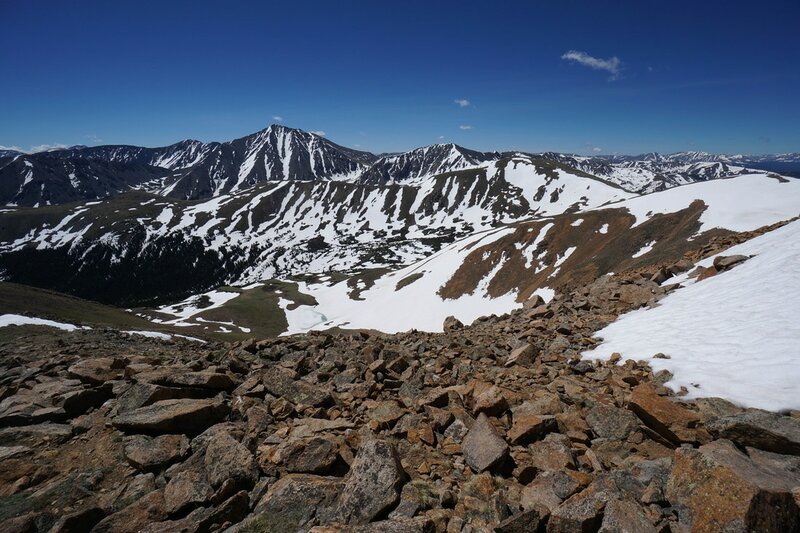 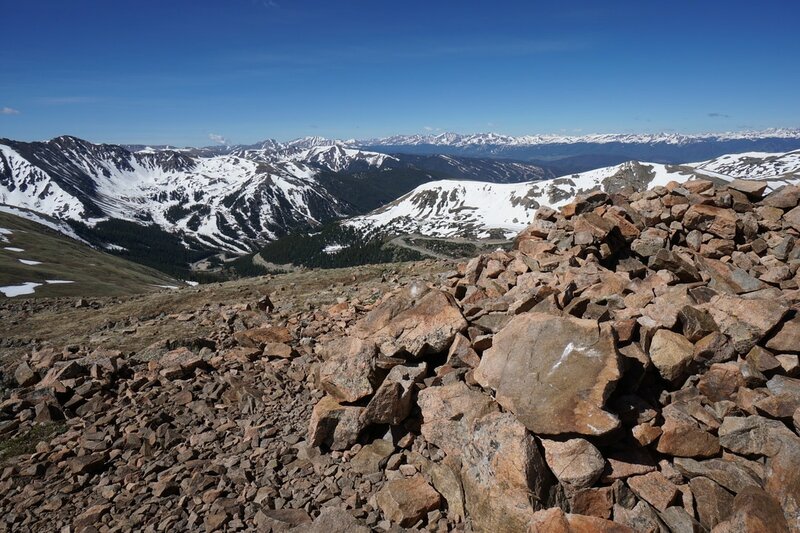 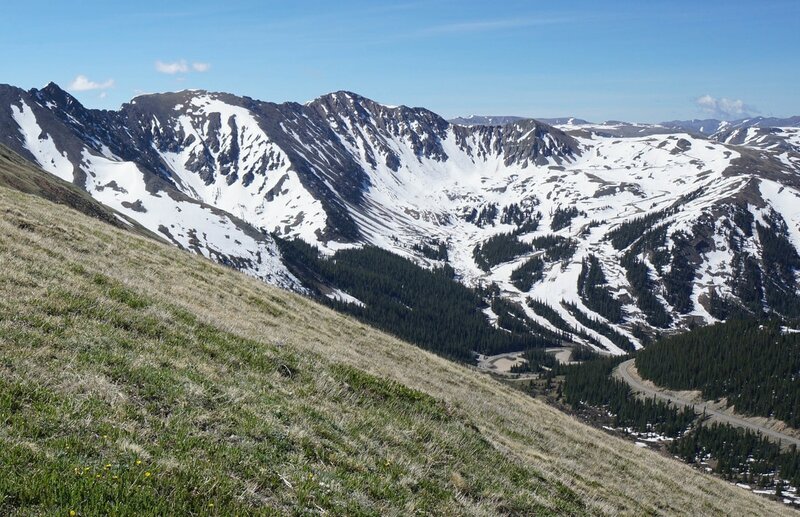 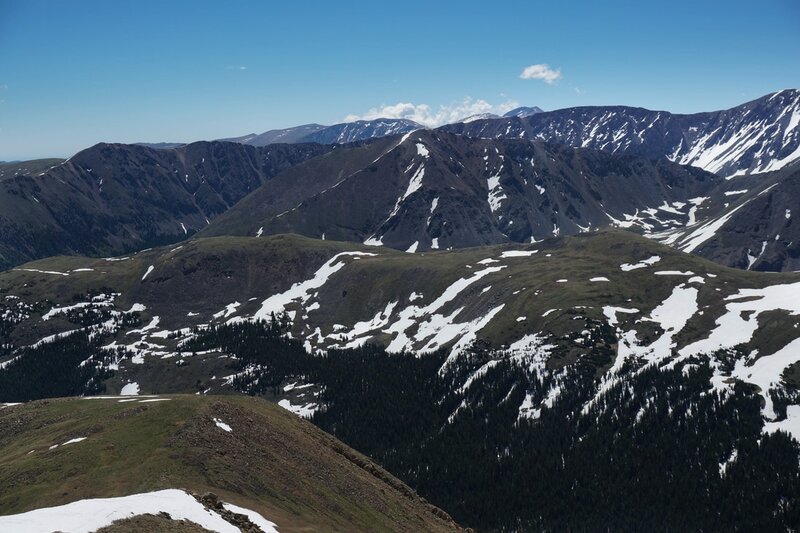 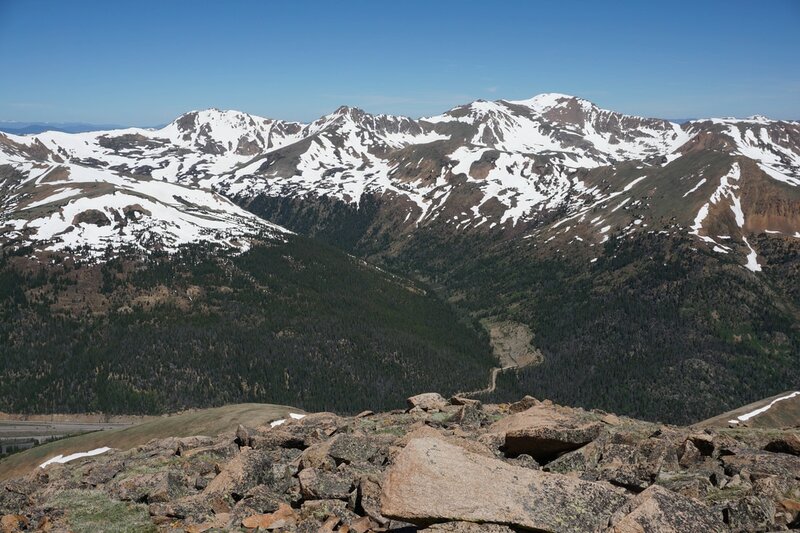 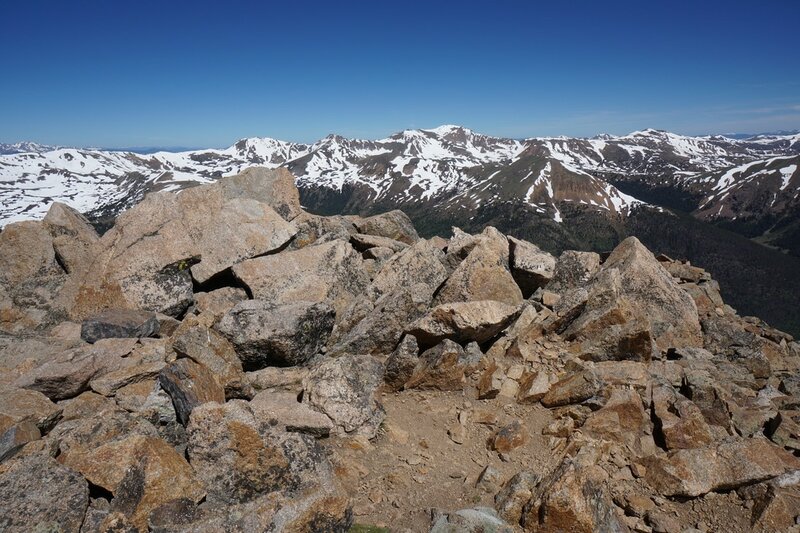 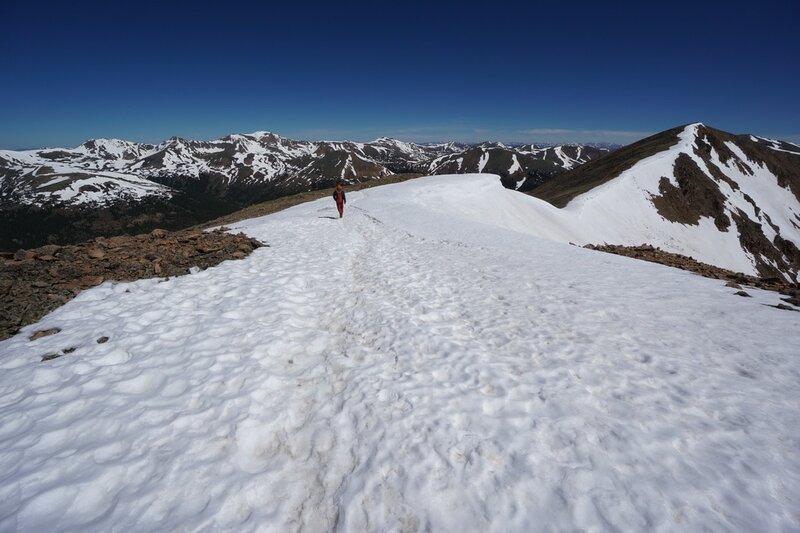 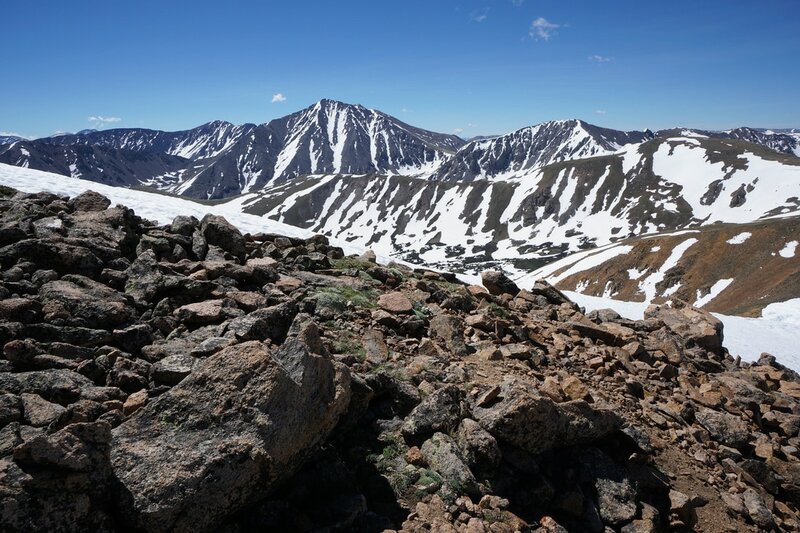 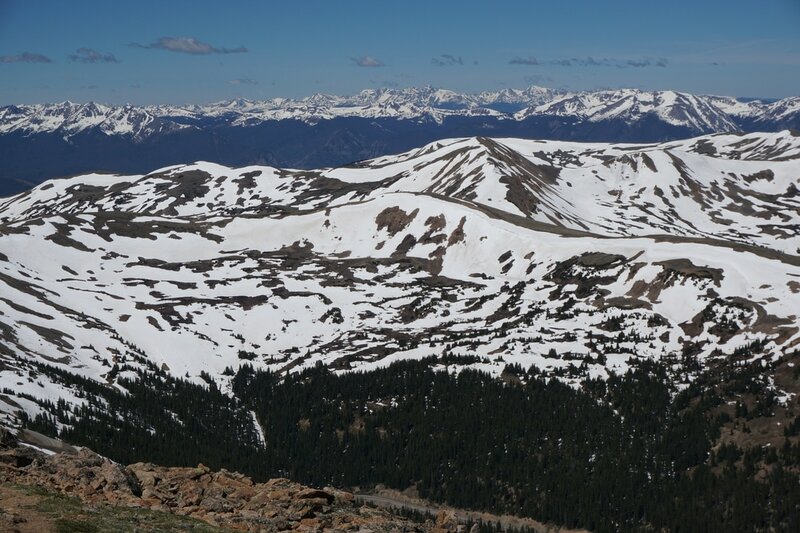 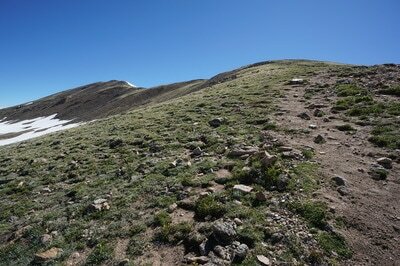 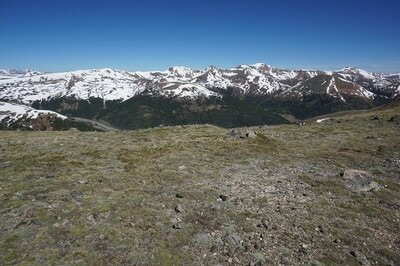 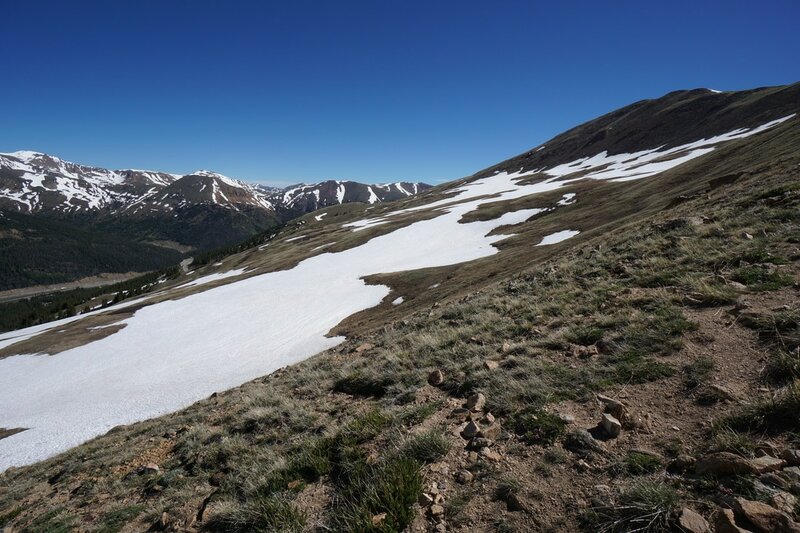 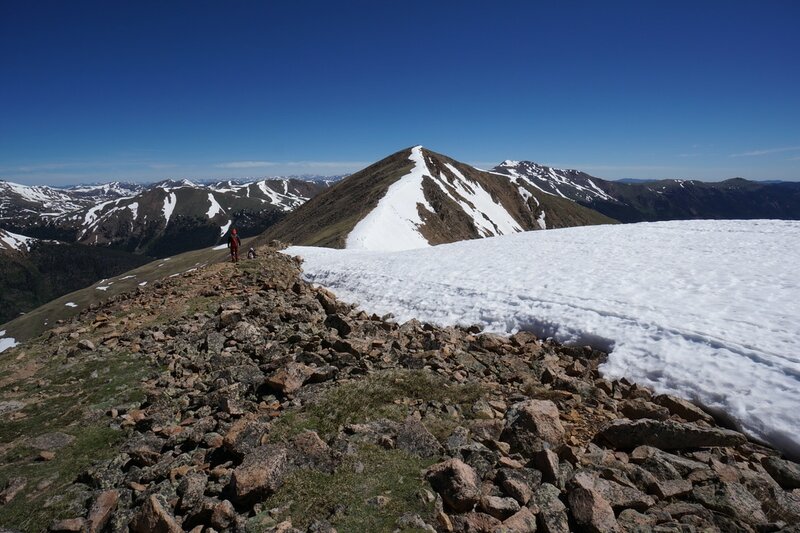 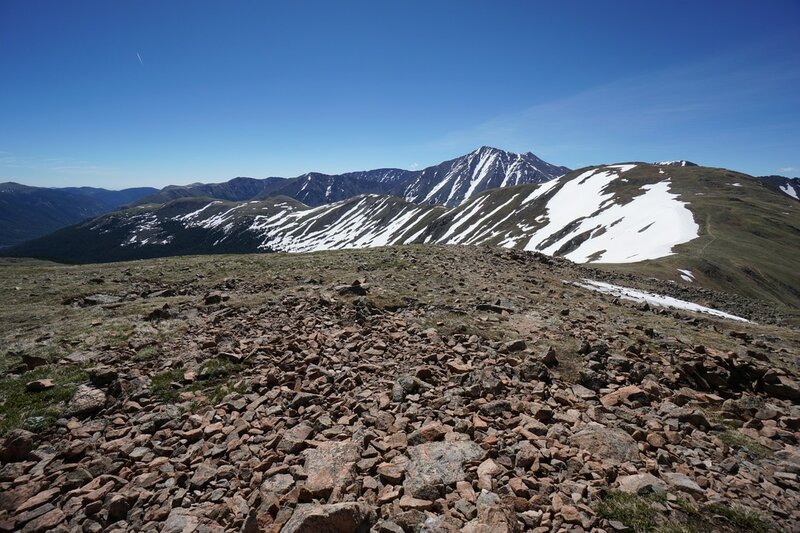 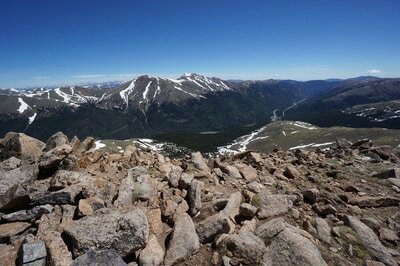 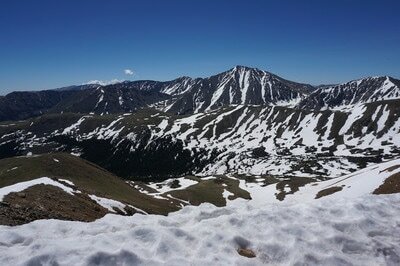 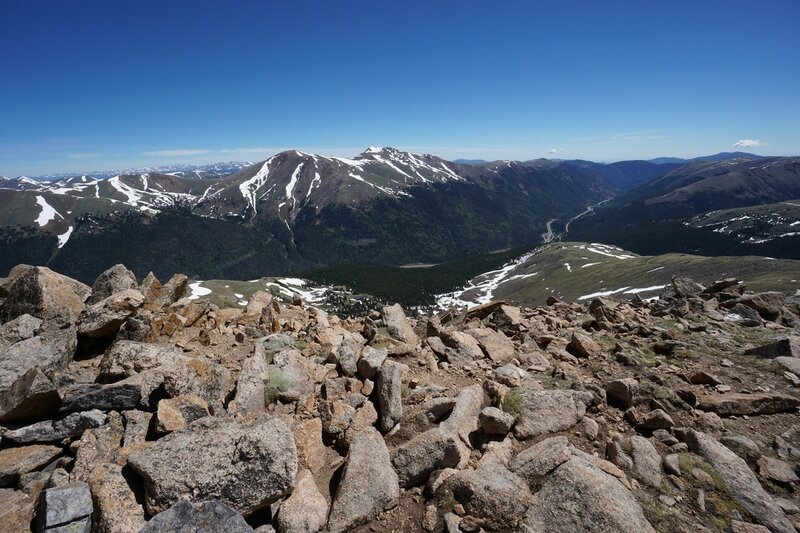 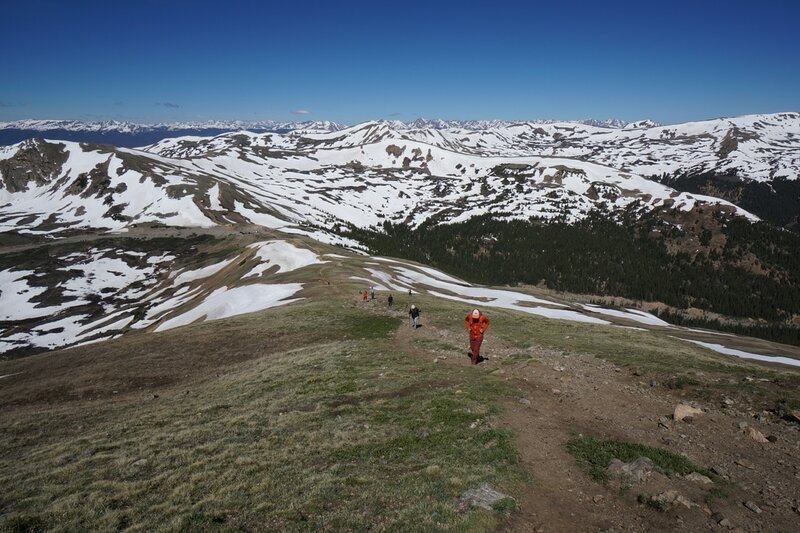 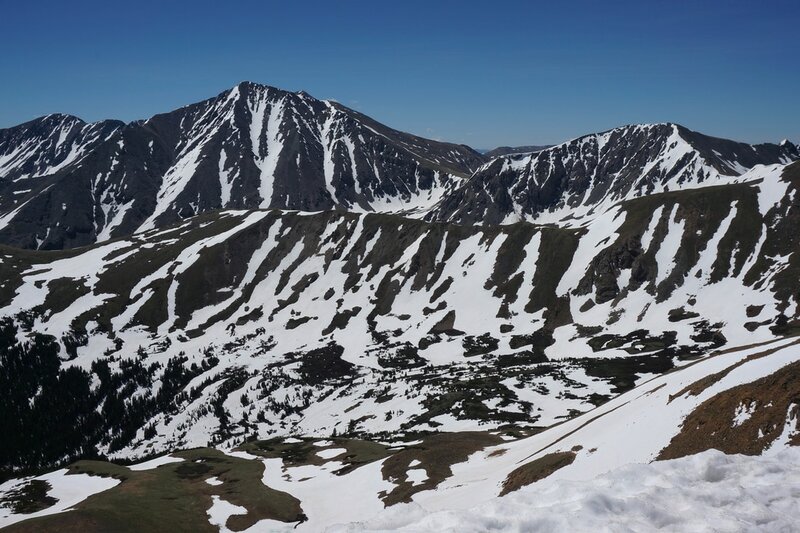 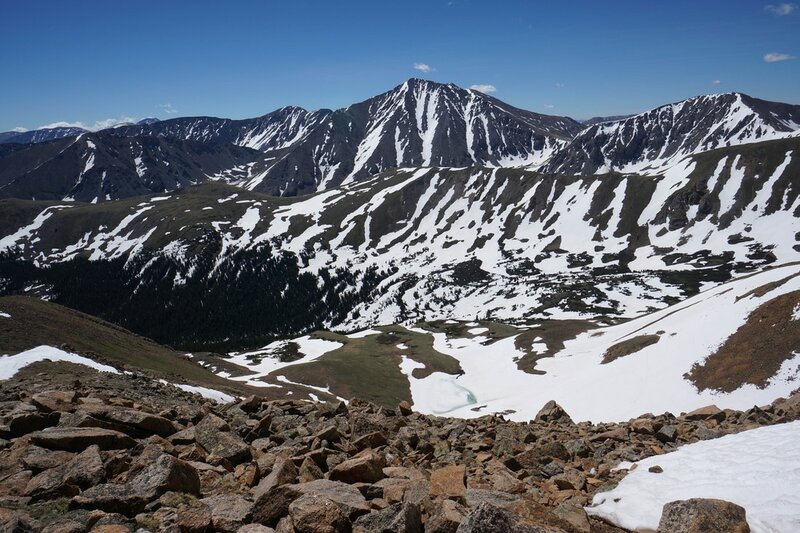 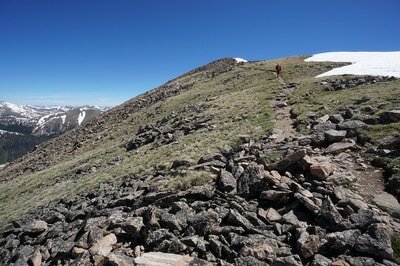 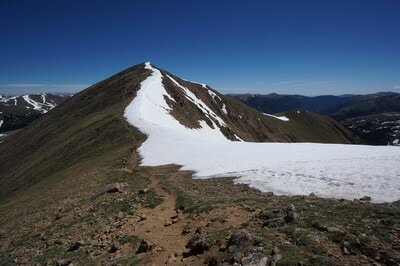 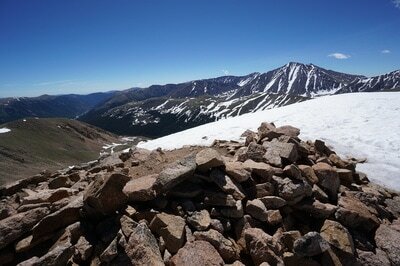 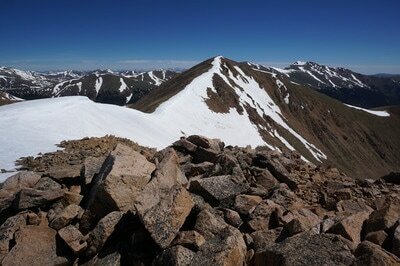 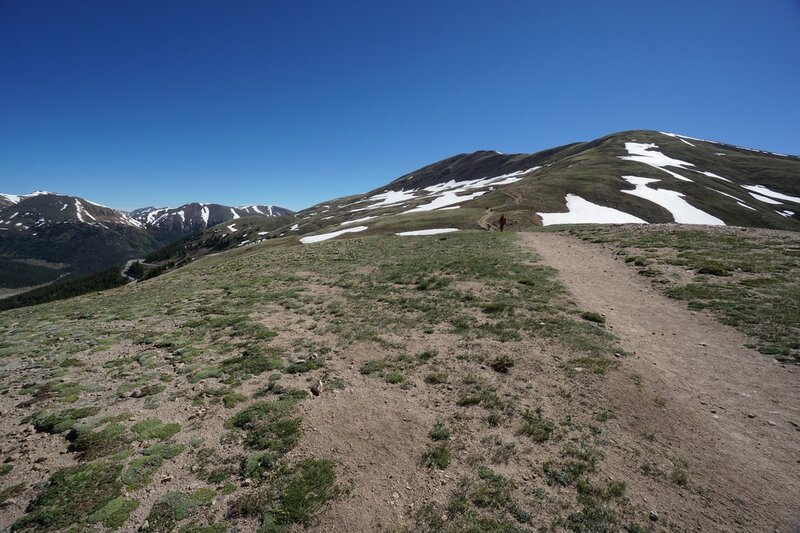 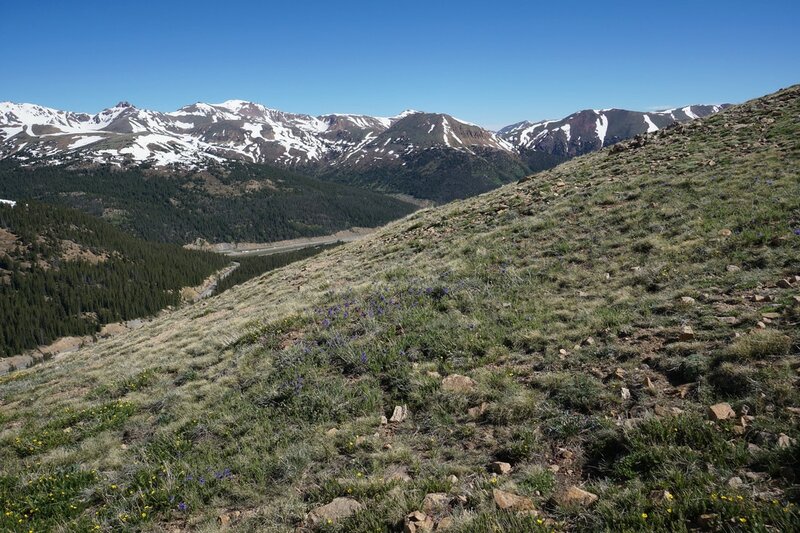 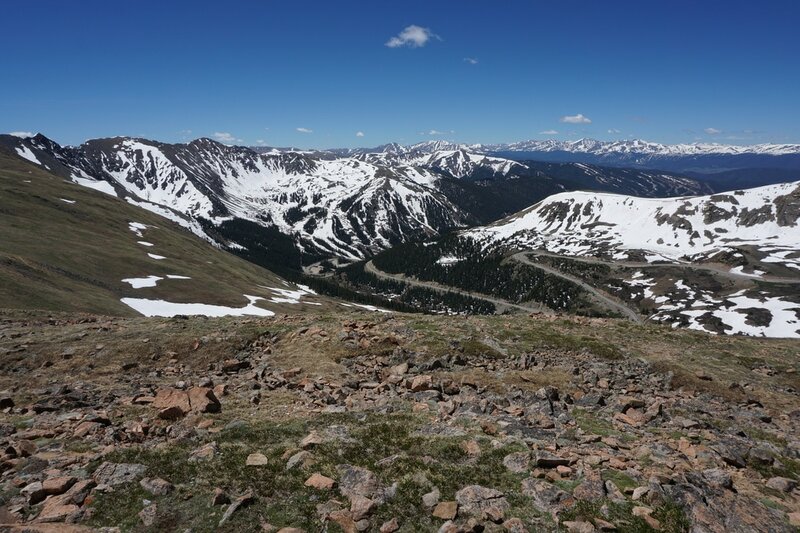 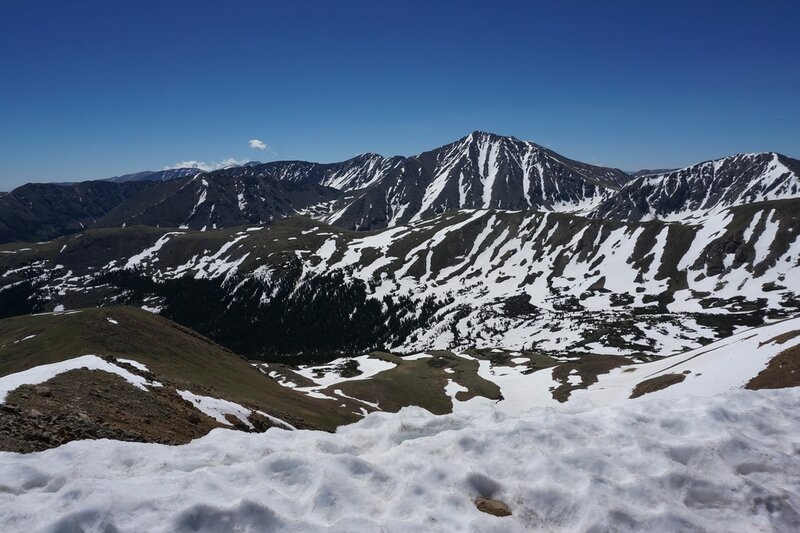 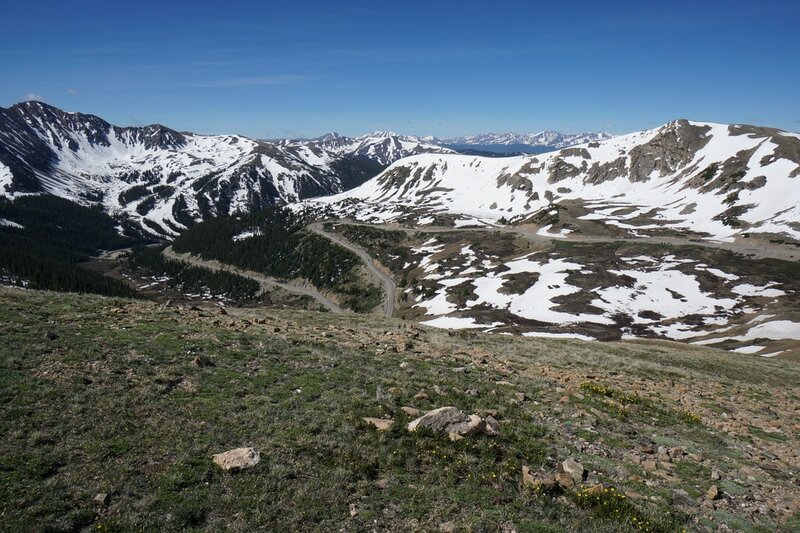 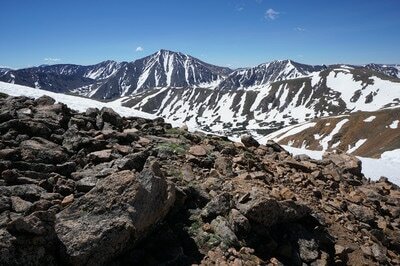 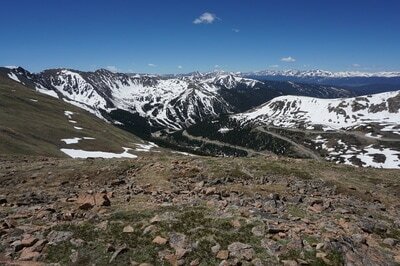 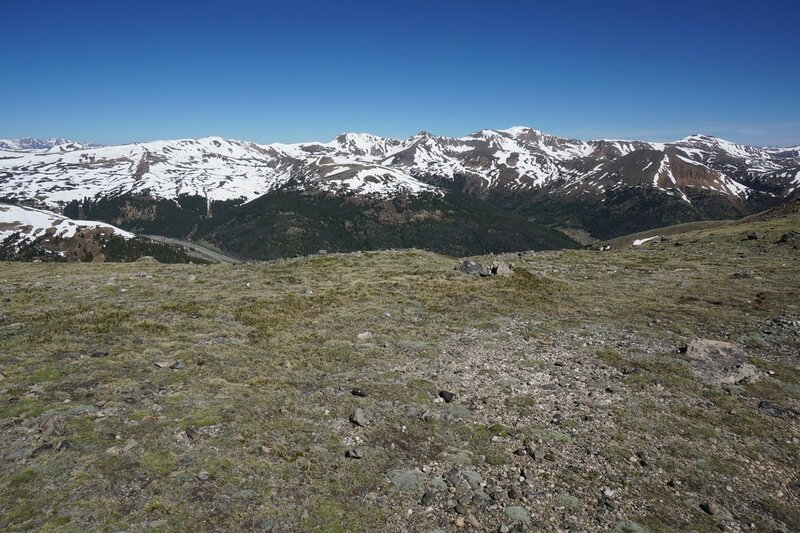 Mount Sniktau is a relatively simple 13er and an excellent early summer high altitude hike. 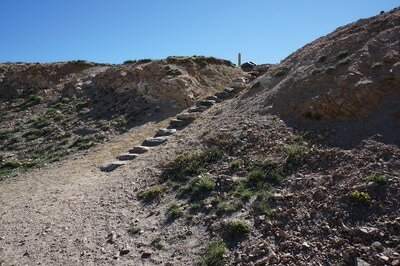 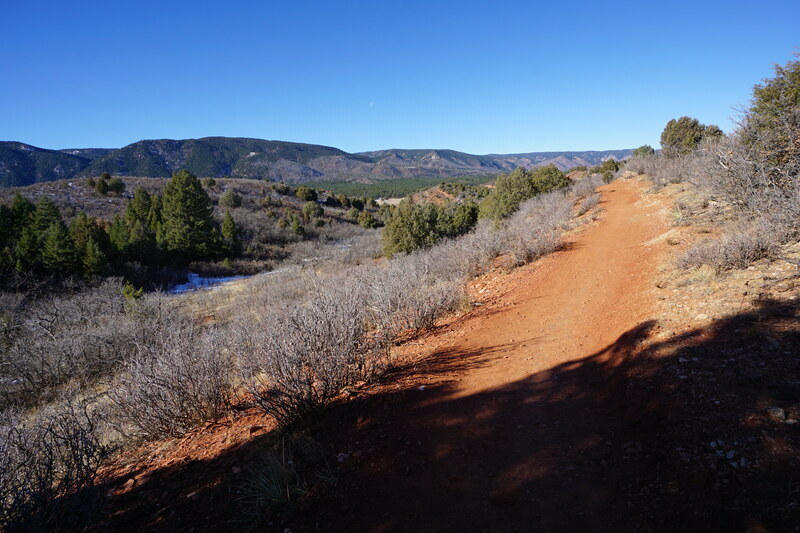 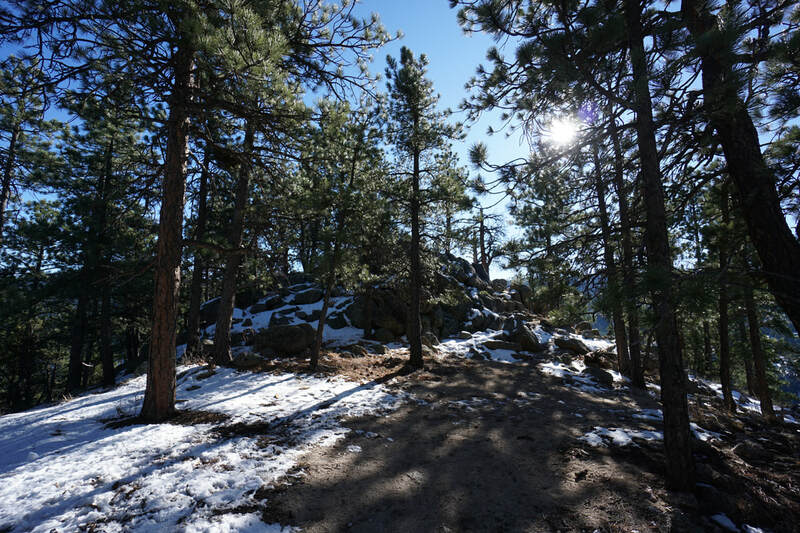 The hike itself is easy to follow and the access doesn't require 4WD or dirt roads. 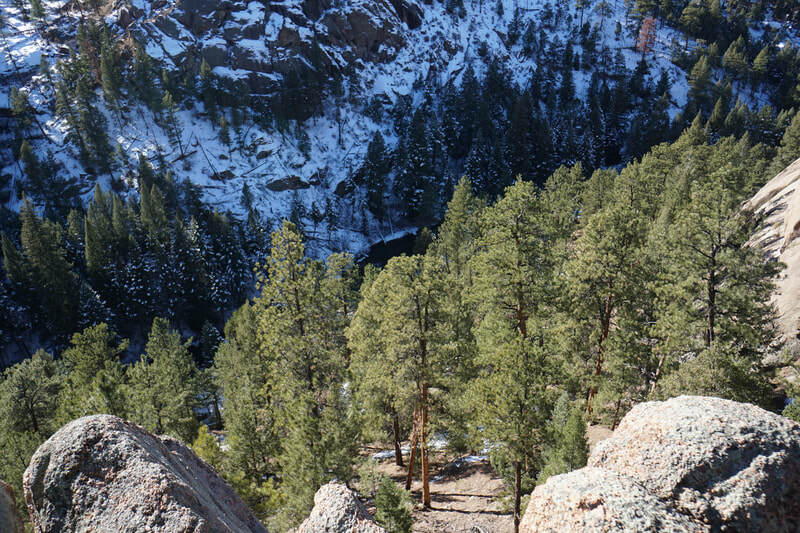 A hike this amazing shouldn't be so simple. 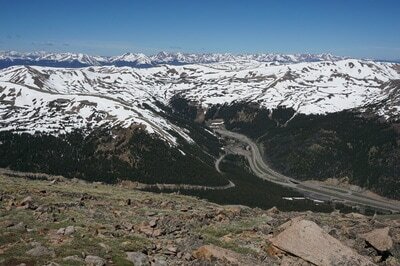 From Loveland Pass head up the steps on the east side of the pass. 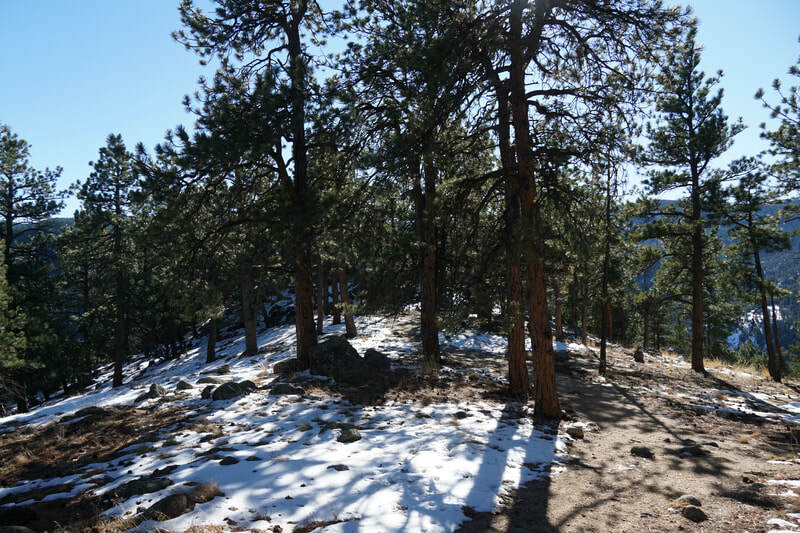 The most difficult part of this hike is the initial .8 miles where you gain almost 1,000 ft of elevation gain up a steep incline, no switchbacks on this one. 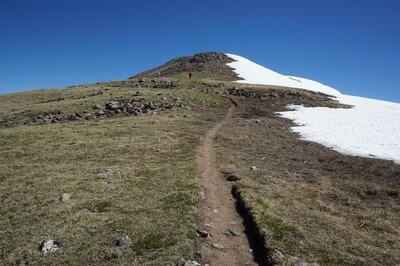 Take you time and go from bump to bump until you reach the saddle. 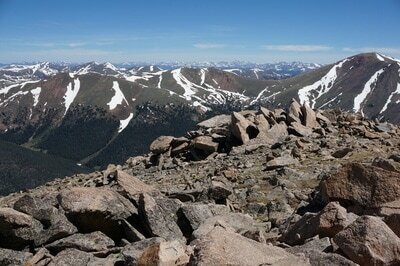 Luckily, the amazing views are immediate, so your struggle will not seem in vain. 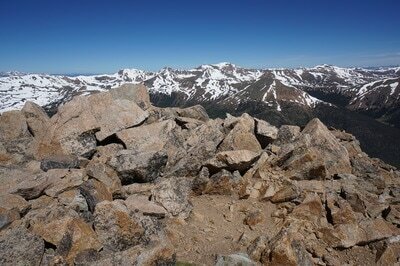 At the saddle, you are likely to encounter fierce winds, hence the multiple stone windbreaks for resting. 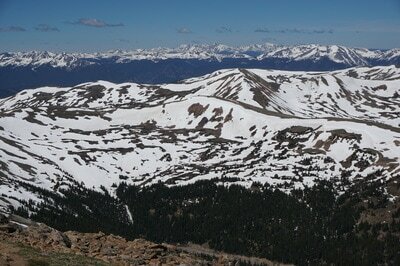 The saddle also presents the first views of Grizzly D, Torreys, and Grays Peaks to the east. These incredible views will stay with you for most of the remainder of the hike. 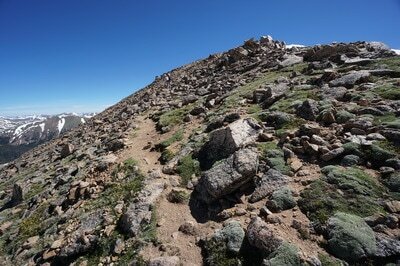 At the saddle, you have a choice, turn right (south) to summit Cupid (Baker) and Grizzly D, both 13ers. 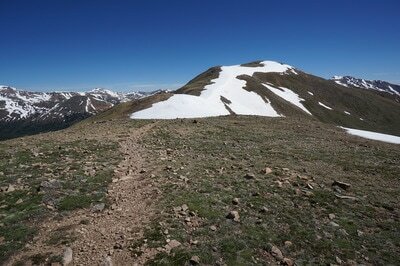 Turn left (south) to summit Mt. 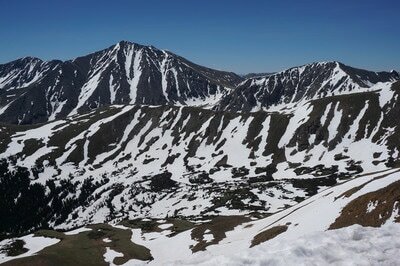 Sniktau. Heading south takes you down and up to an unnamed point, then down and up to what looks like the Sniktau summit but is a dastardly false summit. The views from the false summit are tremendous, but keep going, Sniktau is not as steep and far as it looks from the false summit. 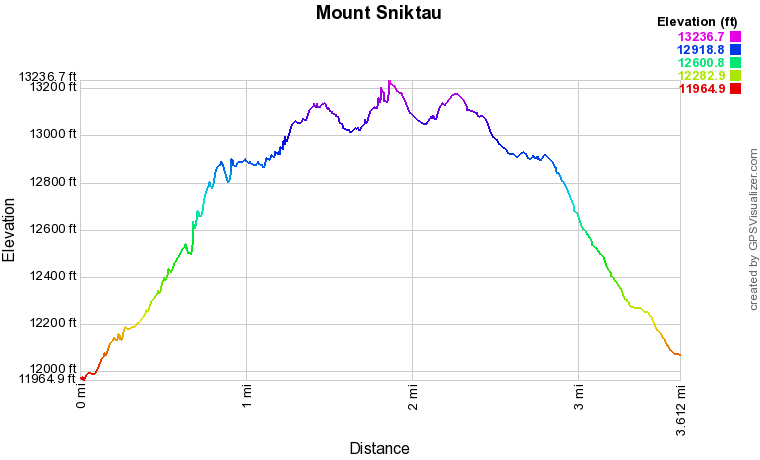 Descend a few hundred feet and start climbing up to the actual summit of Sniktau. 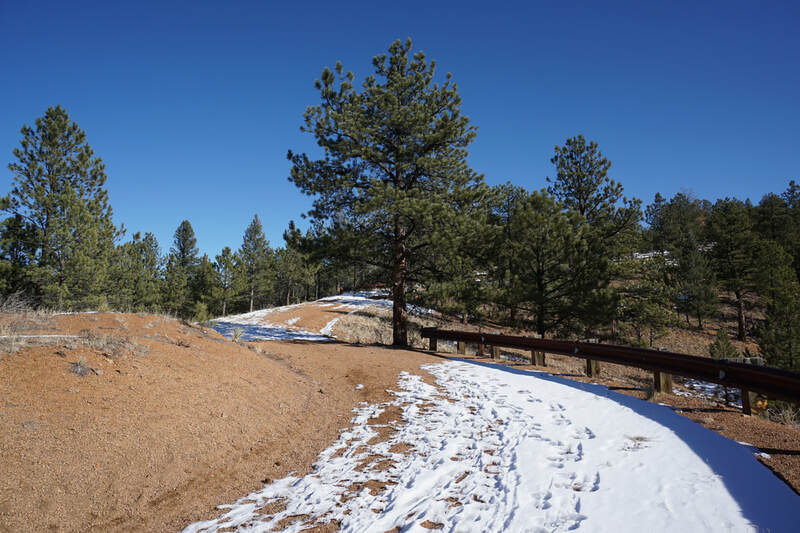 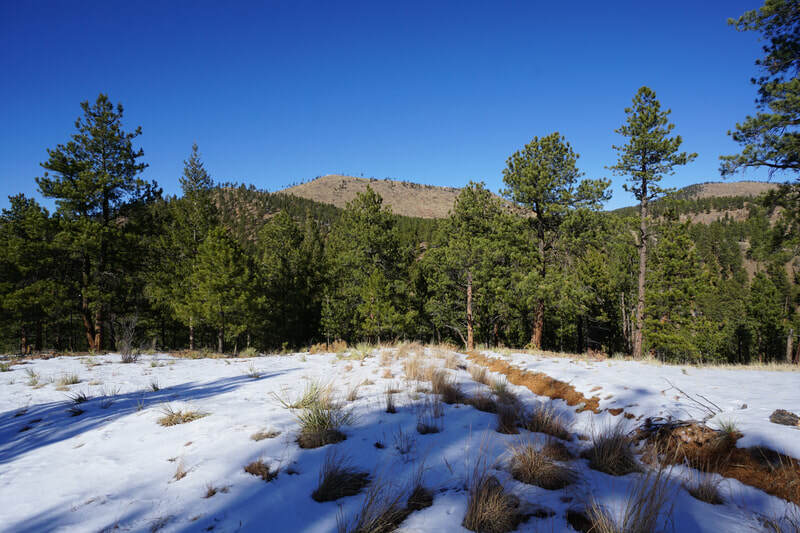 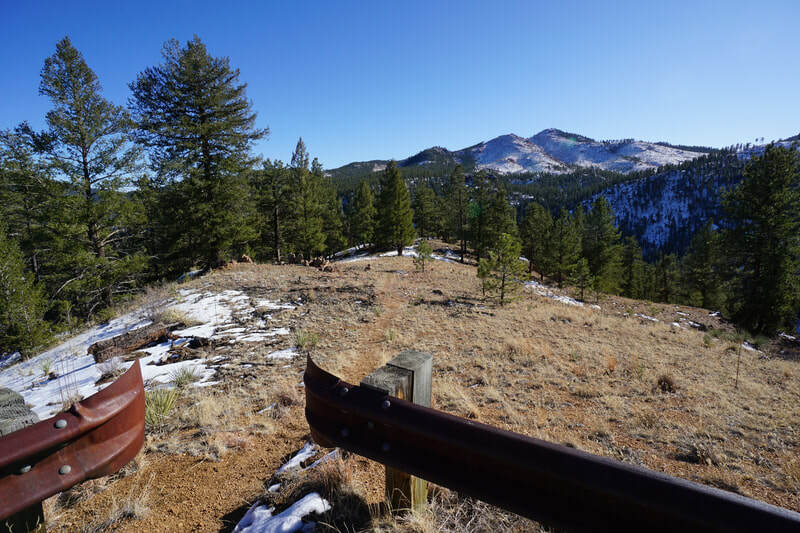 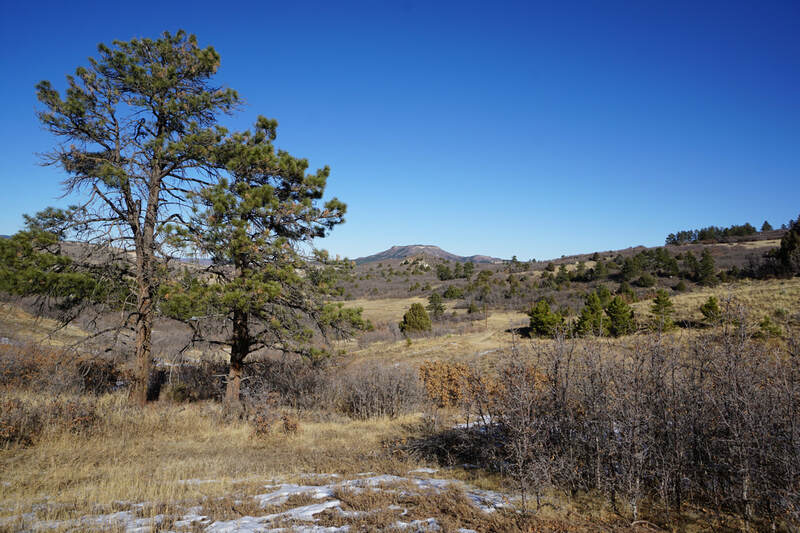 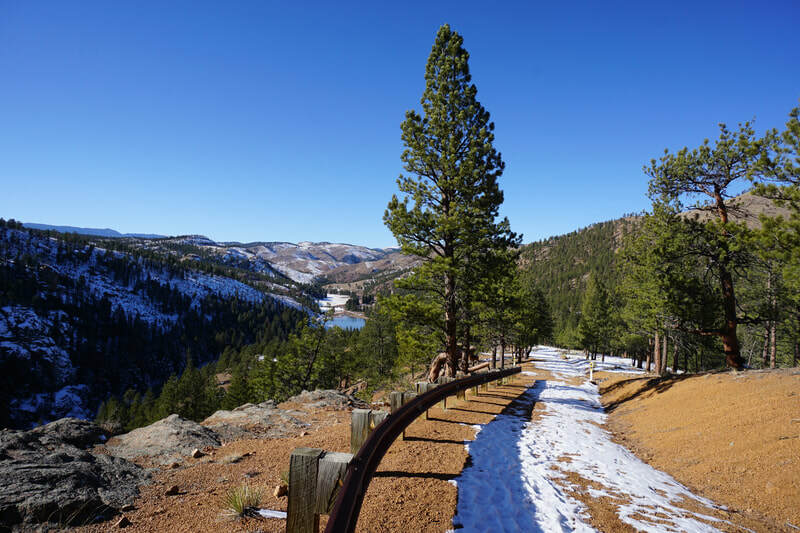 The summit is broad and has nice windbreaks with incredible 360 degree views. A bit of a geography lesson: the main show is Torreys Peak 14,267 ft with Grays Peak 14,270 ft popping up behind; to the left of Torreys in the distance you can just make out Mt. 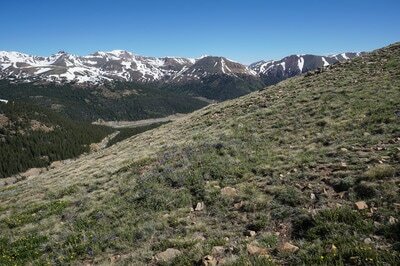 Evans 14,264 ft; to the east, you'll see I-70 with Mt. 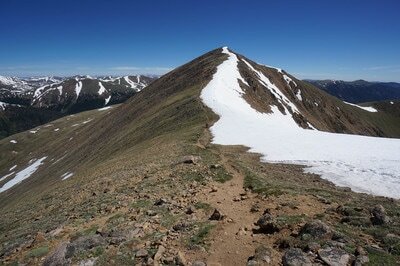 Parnassus and Mt. 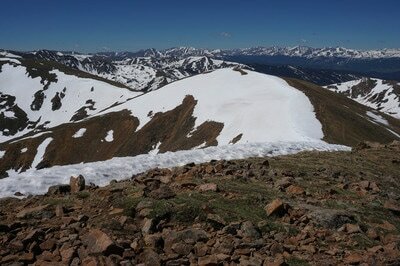 Bard (both 13ers) rising overhead; left of Parnassus, you can see Mt. 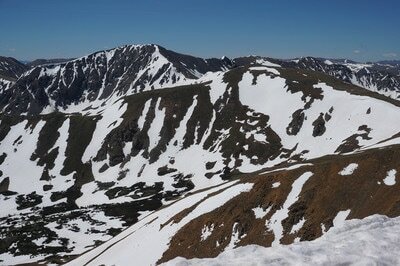 Pettingell and the Citadel above Herman Gulch; far to the north on a clear day you can see Longs Peak 14,255 ft; to the west way out in the distance is Mt. 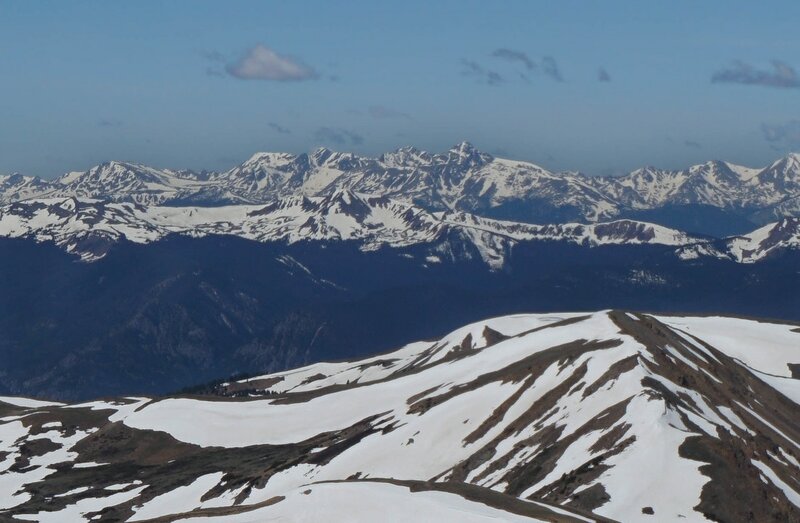 of the Holy Cross with the Holy Cross Couloir in full view in the early summer; Square Top Mountain; the Gore Range; the Tenmile Range; various ski resorts; and a few hundred other peaks round out the view. The way back is the same as you came with options to continue past the saddle to Cupid, Grizzly, and beyond. 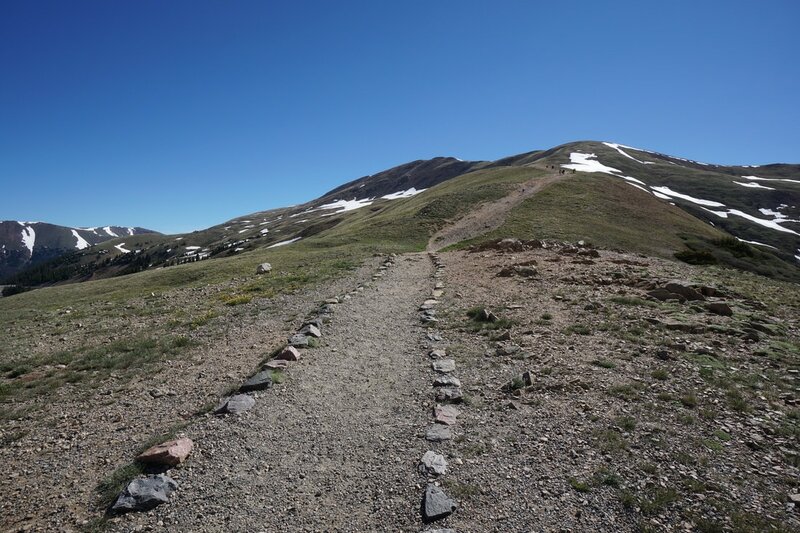 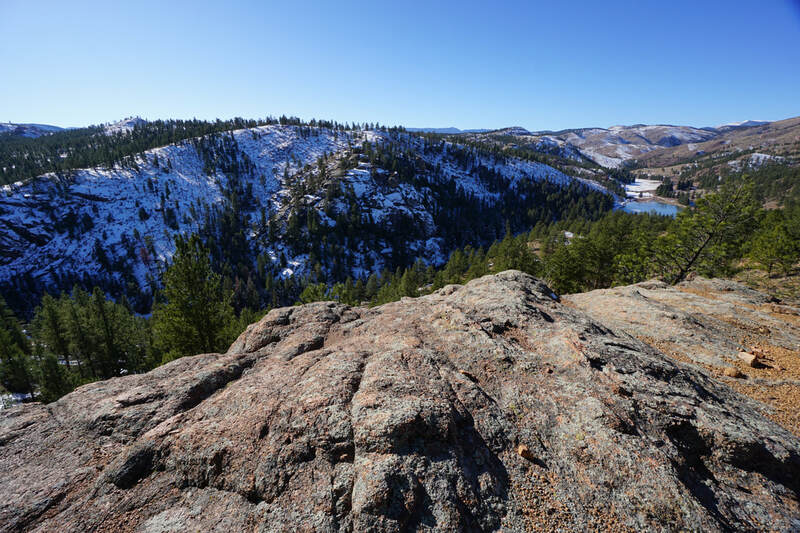 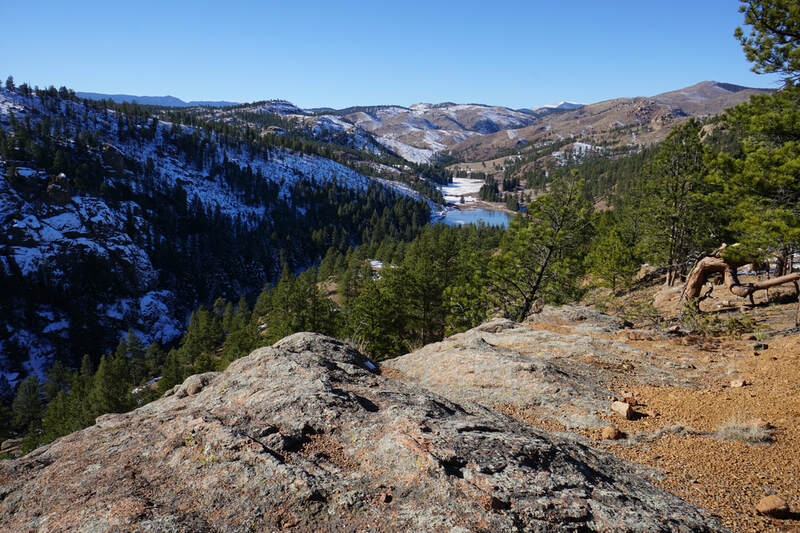 This hike is simply incredible and so easy to get to from Denver. That being said, the hike is entirely above treeline so you need to be vigilant about the weather, the hike is entirely above 12,000 ft so altitude makes hiking and breathing difficult, and the chances of you being alone on this hike are relatively small during summer weekends so start early and hike on weekdays.